My parents have told me that ever since I was little, I was a fighter. I have never given up. Although I have been in the darkest depressions and done so many things I have regretted when I was manic, I have not given up. I can tell you that at times, it would have been easy to throw my hands up and surrender to this illness. In some ways I have. I have accomplished a lot in my life despite my illness including graduating from college and teaching. However, I do tend to regret the things I had wanted to do before my illness struck. I was not able to go into the career I wanted and now I am even on disability. I miss working yet know that right now, I could not possibly have a full time job. I want to conquer this illness and go back to work. I want to live a life where I can plan things and not have to worry about being sick and having to cancel. Bipolar disorder has gotten in the way of friendships. I have had so many great friends over the years. Unfortunately, I would get manic and scare them or withdraw from them because I was depressed. Oftentimes, I stopped keeping in touch because I was embarrassed by the things I did when I was manic. I often wonder how many of those great friendships would have lasted if I had not been the one to let the friendship fade away because I was embarrassed. The biggest way that my illness has gotten in the way is by treating my family and closest true friends in horrible ways when I was manic. I have been very lucky that I have had a family and some friends who have stuck by me and loved me unconditionally. They understand that the things I said when I was manic were because I was sick. Their forgiveness is not really deserving, but I am so grateful they have stood by me throughout the years. I like to say that even though I have a mental illness, I am just like everyone else and I can do anything I set my mind to do. However, in reality, I am not sure how true that is. I won’t ever be able to work as an interpreter for the United Nations like I always wanted to do. I am not sure if I ever will learn how to make friends that I can keep. One thing I do hope is that I can stop hurting the ones I love. I wish I could take all the hurtful things I have done over the years, but I can’t. My illness has gotten in the way of who I want to be. If I try and look on the positive side, I can think that eventually I won’t have such huge mood swings and will find the right treatment to keep my symptoms at bay. I hope that day comes. Until it does or even if it never does, I won’t give up. I will keep fighting. However, it does seem to get harder to fight the fight after each episode. I try and forget the bad things as they would wear me down. I move on as that is the only thing I can do. Dwelling on the horrible things will make things worse. I usually am not so negative about my illness, but wanted to share a reality that I have left out in other posts. Better days are ahead and I hold onto that. I may not do the things I once wanted to do and won’t be able to get back those friends or take back the awful things I have said and done, but I can find things I can do where my illness won’t get in the way. 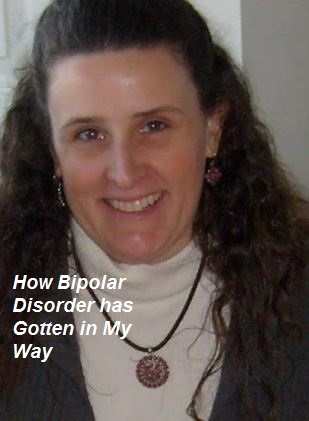 This entry was posted in Uncategorized and tagged bipolar disorder, depression, mania. Bookmark the permalink. The reality of having a mental illness is having to accept the things that we had to give up because of the illness. Some days it is not so easy to accept what we have lost because of mental illness. Thanks for taking the time to encourage me. It means a lot.